Kuusamo is a town and municipality in Finland. Visiting Safaris and Karhunkierros will get you outdoors. 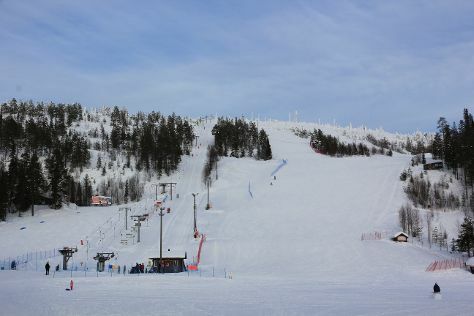 Explore the numerous day-trip ideas around Kuusamo: Riisitunturi National Park (in Posio), Suomussalmi (The Silent People & Martinselkonen Wilds Centre) and Salla Ski Resort (in Salla). And it doesn't end there: look for all kinds of wild species at The Predator Center in Kuusamo, stop by Riipisen Wild Game and Souvenier Shop, explore the striking landscape at Julma Olkky, and hit the slopes at Ruka. Discover how to plan a Kuusamo trip in just a few steps with Inspirock's itinerary builder. Expect a daytime high around 3°C in October, and nighttime lows around -1°C. Wrap up your sightseeing on the 23rd (Tue) to allow time to travel back home.